In France, Horria continues her struggle against political violence against women and religious extremism. More than a decade after the release of Algérie en Femmes in 1996, her film continues to be relevant as evident in the venues to which she is invited to screen and discuss the film. Notably, at the 2008 meeting of the French-based Union des Familles Laïques (Mouvement laïque d’education populaire) of which she holds the post of president of the UFAL-Saint-Denis. 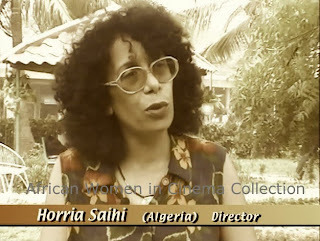 Horria also presented Algérie en Femmes at the Maison René-Ginouvès, Archéologie et Ethnologie in November 2009, and in 2007 the film was featured at two events: as part of International Women’s Day she participated in the colloquium, Rencontre féministe sur les Femmes et l'Algérie organized by the Marche Mondiale des Femmes contre les Violences et la Pauvreté, and at the Festival Cineffable at which the film won the ProChoix Award—all venues are based in France. Algerie en femmes resembles the title of a film that was made by René Vautier, which is called Algerie en flamme, it was about the war of liberation. In Algerie en femmes, I speak of the struggle of women. It is an intersecting perspective of a woman filmmaker and a woman photographer. The latter makes an imprint of the moment, the former speaks about her profession. There is also another realm of women: an artist-painter who continues to paint although it is prohibited; a peasant woman who takes up arms; and the wife of a director of fine arts—her husband assassinated at the same time as their son. I speak both of life and death simultaneously. It is this combat of which we are in the midst at the moment. Festival Cineffable : ProChoix rend hommage au film "Algérie en femmes"